This brand new, fully furnished property is the perfect place to unwind. Whether it be hiking, fishing, or riding the state snowmobile/4 wheeler trail. There are plenty of options for unwinding. Perfect for a family or grown-up get-away. Property has 2 bedrooms and two full baths, in a fully furnished 1160 sq. ft. home. There is also an additional semi-finished living space in the basement., with two double beds and a double pull out couch. The home currently sleeps up to 10. 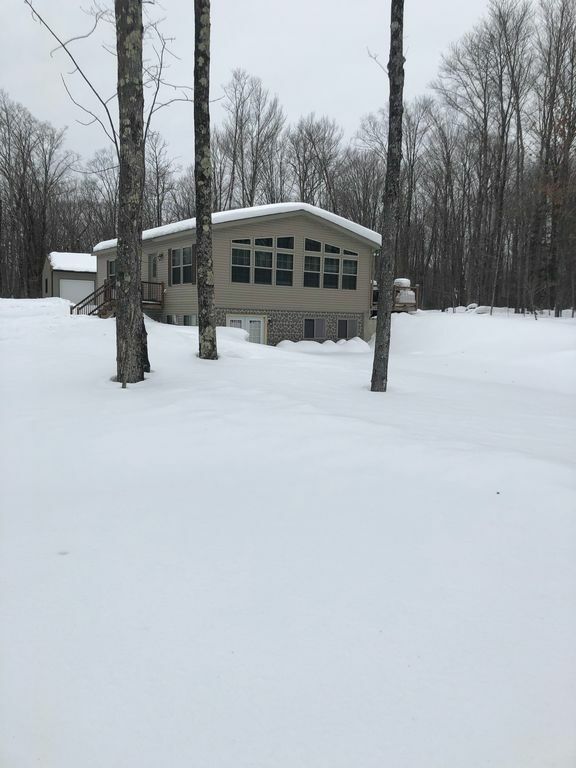 Just 2.5 miles from the Chippewa Flowage, with direct access to the state ATV trails. Just 3 miles from the famous Winter Greenhouse. Raccoon Run LLC is a small family owned and operated vacation property. Owners Tony and Vikki Price were born and grew up in Wisconsin. Tony served 24 years in the Air Force and recently retired. He has started his next career in Arkansas. Vikki works in banking and has made a successful career of it. Tony and Vikki have two children. Daughter, Alyssa, recently graduated college and has begun her career in management. Son, Kris, graduated from High School in 2015. Tony and Vikki had the opportunity to purchase this 10 acres of land in 2010. The land was to be an investment to be passed on to their children one day. After 5 years, in 2015, Tony and Vikki decided to have a house put on the land. The house is a place for the whole family to get together once a year, far away from the hustle of everyday life. Plenty of room for RV and trailer parking. Very nice house, everything clean. Would visit again if going to be in the area. The house was very clean and neat. Visited for a memorial fundraiser in the area and enjoyed out stay. I am sure the area would be much more inviting if it weren't below zero! Super clean very nicely decorated very modern appliances. Cannot say how much we enjoyed our stay. What a great place in the middle of the woods. Clean modern spacious. Beautiful decor. Just loved it!! Big parking lot to turn trailers around. Warm and cozy. This very clean warm home was nestled in the woods with a beautiful view everywhere you look. We saw deer and other wildlife outside. Plenty of room for everyone! The grandchildren ranging from 8 to 12 had the best time playing games. They loved the big room downstairs with sleeping for 6. We are hoping to do this again and would strongly recommend this place to other families. The weather was very cold but the boys and men went ice fishing on Lake Winter with the large ice shanty. A few tears came when it was time to leave. Great memories! Thank You! Thank you for the review. We are glad you enjoyed the stay. Please come again! This place was perfect for our family’s ATV trip! The house was cozy and very inviting. Driveway was perfect for bigger setups and had plenty of room for my trailer. The owners came out to welcome us and answered any and all questions. Directly on ATV/Snowmobile routes. We will be back!!!!! Highly recommend!!!! It was great had a good time. It was a very neat. And clean home we loved it. The house is very nice and comfortable. Upstairs master bedroom is spacious and comfortable. Bed in room 2 is also nice. Our guest in the downstairs sleeping area thought the beds were adequate but the matress es could be replaced. They also recommended blinds be placed over windows. We enjoyed watching the deer as they checked us out the first night.